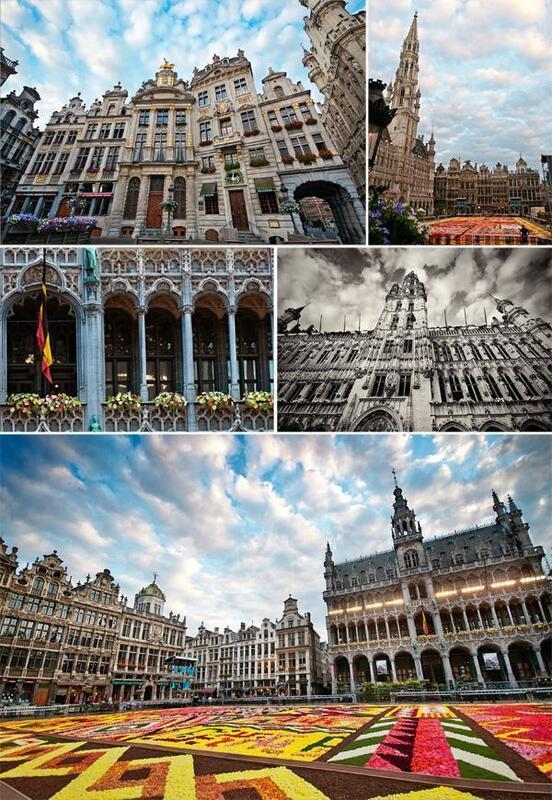 Every other year, for five short days, the Grand Place of Brussels, Belgium is a riot of colour. 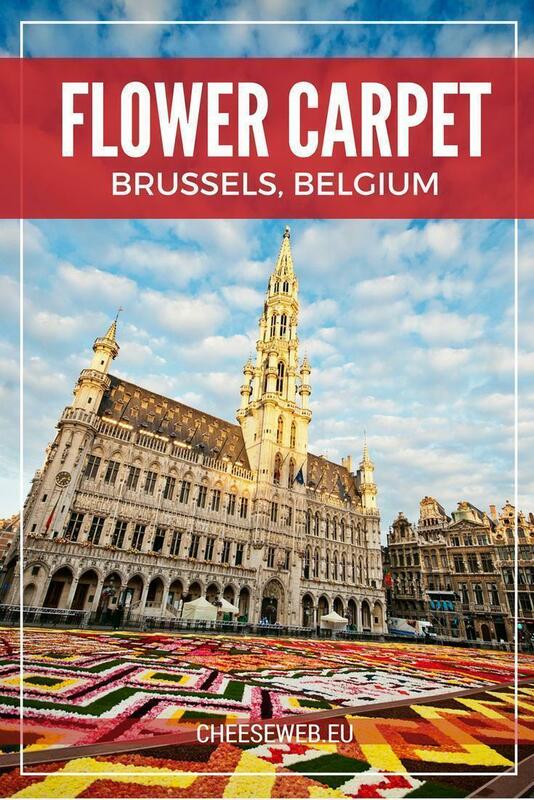 The bi-annual Flower Carpet appears on postcards, calendars and images of Brussels for years to come, but only those who visit the city during those special days in August are lucky enough to see it in person. This year, early one morning, we were among them. 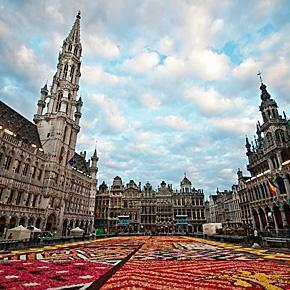 The Flower Carpet in Grand Place began, as we know it, in 1971, but the idea took root long before. E. Stautemas, a landscape architect from Zottegem, began experimenting with the Flower Carpet idea in the 1950s. Stautemas had a passion for begonias and began creating small flower carpets in various cities in Flanders. His fame spread and soon his designs appeared in Luxemburg, Paris, London, Amsterdam and as far away as Buenos Aires and Colombus, Ohio. 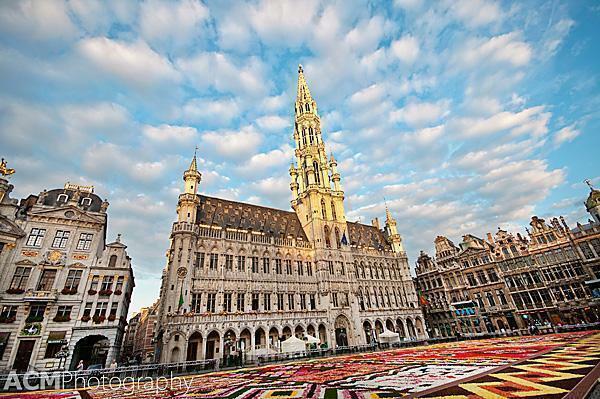 The historic architecture of Grand Place adds to the magic of the Flower Carpet in Brussels. 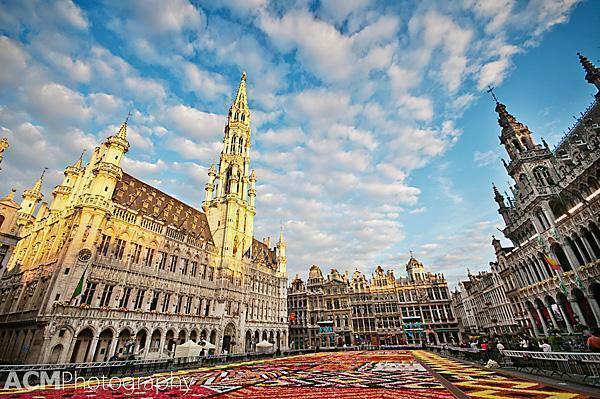 The first few years, the carpet’s appearance in Grand Place was erratic, but it quickly became a biennial event. After Stautemas death in 1998, landscape architect, Mark Schautteet, became the vision behind the Brussels Flower Carpet, beginning with a Belgian lace theme in 2000. Creating a carpet of flowers, large enough to fill the Grand Place, takes a lot of planning, materials and (wo)manpower. Plans are drawn up for the Flower Carpet a year in advance. The designers decide on colours and calculate how many flowers need to be grown for the year’s theme. In 2012 over 600,000 flowers made up the African themed carpet. Begonias continue to be the preferred flower of the Brussels Flower Carpet (although other blooms, such as carnations are also used). Although they originated in the West Indies, 80% of the carpet’s begonias are cultivated in Ghent. In fact, Belgium is the world’s largest producer of begonia tubers, cultivating 60 million each year. Because of the ephemeral nature of flowers, the actual construction of the Flower Carpet has to happen quickly. The first step is to cover the cobblestones of Grand Place with plastic and lay out an outline of the design. Then, 120 volunteers fill in the colourful pattern, packing the flowers tightly. This prevents them from blowing away, but also creates a humid microclimate that keeps the begonias looking their best. The completed Flower Carpet measures 1800 m2 and is admired by thousands of visitors, every other year. 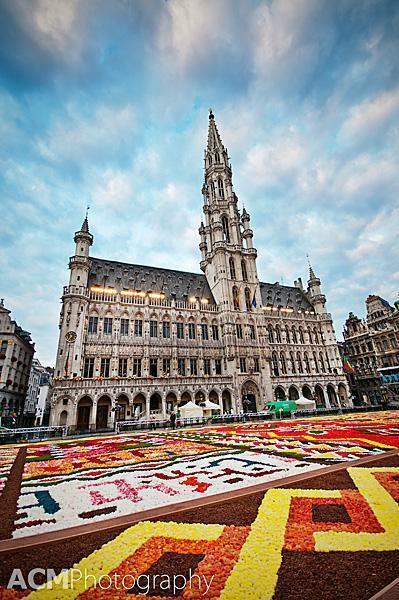 Each year, the Grand Place Flower Carpet design has a particular theme. For 2012, the theme was Africa, and the design drew inspiration from the tribes of Ethiopia, Congo, Nigeria, Botswana, and Cameroon. This year to compliment the begonias, and help create the African motif, the designers included barks, sands, soils and pigments in the design. In addition to begonias, this year’s carpet contains soil, sand, turf and wood chips. Visit early in the morning. We were in the Grand Place around 7 am. The light was beautiful as the sun rose over Grand Place and there were very few other visitors. Get a birds-eye view from the Town Hall for €5 and be able to see the entire design at once. Visit the day before the Flower Carpet’s official opening to watch the workers assemble the design. Visit the Flower Carpet early in the morning for no crowds and beautiful golden light. 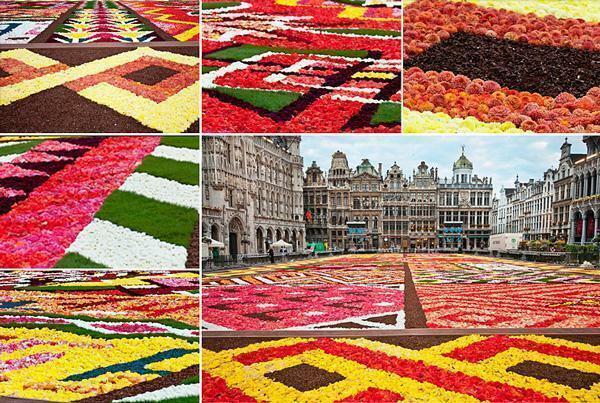 If you didn’t get a chance to see the 2012 Flower Carpet in Brussels Grand Place, I hope our photos will give you a taste of this stunning display.